"Ovaries So Big, We Don't Need No Balls"
How did Soc Doc launch you into this kind of work? Kate: I applied to SocDoc because of its social justice focus. I did not want to go to traditional film school. And I don’t think I ever really believed I could pursue documentary filmmaking as a career. The field is competitive, uncertain, a challenge to get funded. That was terrifying to me. But producing my thesis film changed all of that. Joanna: I entered SocDoc with not much confidence about what I had to offer as a filmmaker. Working with badass women like B. Ruby Rich and [former SocDoc co-director] Renee Tajima-Peña really drew so much out of me. Not only is their personal work inspiring, but the environment they created undeniably changed my vision of what filmmaking could be. 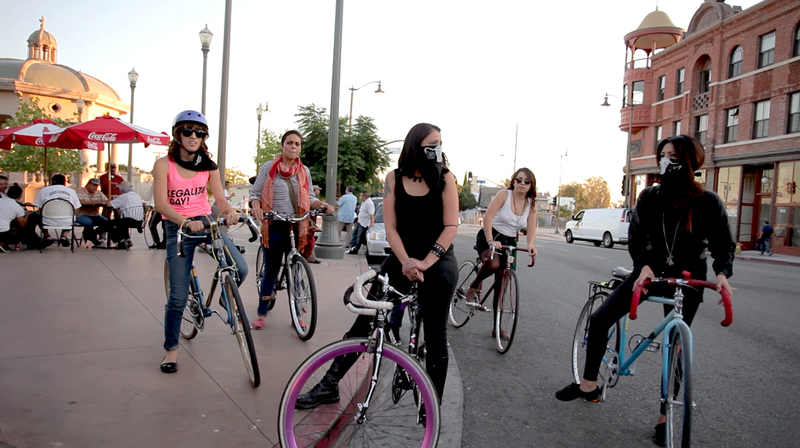 Kate: Our documentary is titled Ovarian Psycos – it follows the story of an all woman of color bicycle brigade, the Ovarian Psycos Cycle Brigade. 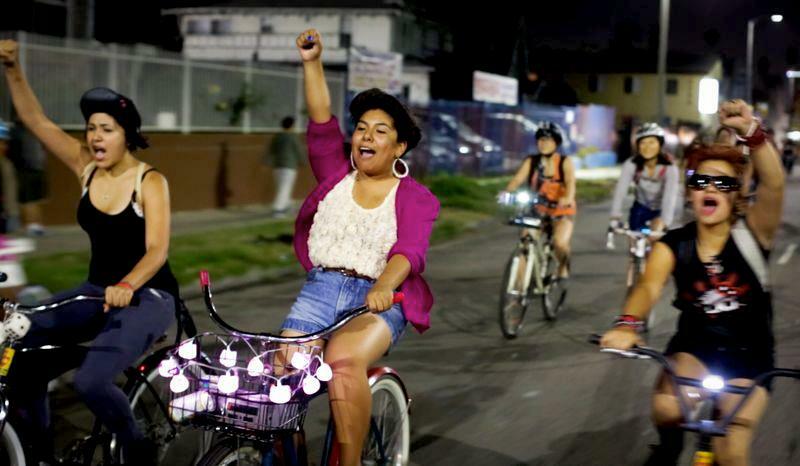 Based in Boyle Heights, a neighborhood in Eastside Los Angeles, the Ova’s are a collective of unapologetic, politicized, young Latina women who host monthly bike rides every full moon for women and women-identified riders. Joanna: There are lots of bike groups in LA, but what’s unique about the Ova’s is each ride has a socio-political theme and ends with a group discussion. They dialogue about everything from violence against women to the gentrification of Boyle Heights. Why did you decide to make a film about the Ova’s? Kate: I first learned about the Ova’s while working as associate producer for Renee Tajima-Peña’s film, No More Babies for Life. 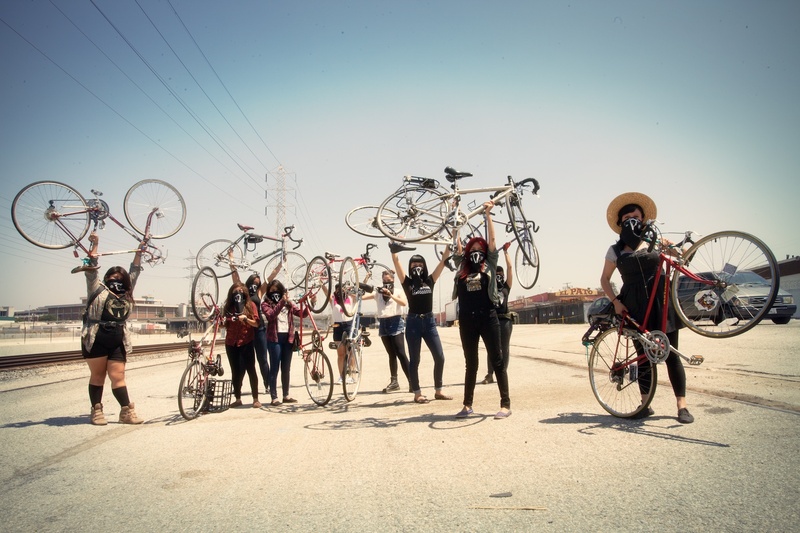 It’s an East LA story and one afternoon, while brainstorming outreach partners with producer Virginia Espino, she mentioned this Eastside bike group called Ovarian Psycos. Ovarian Psycos? I called Joanna later that day, we visited their Facebook page, and read everything we could about them online. From their motto, “Ovaries so big, we don’t need no balls,” to their no woman left behind policy, ovaries “gang sign,” and brilliant use of language - what’s not to fall in love with? We were hooked. Joanna: Kate and I are great friends and share a similar vision for the types of films we want to produce, so it was natural that this would be the film we set out to make. We reached out to the women. It took some time off-camera to build trust and convince them, but they finally agreed to let us start filming. It was perfect timing: they were busy organizing LA’s first “Clitoral Mass.” We got to capture this incredible underground story as it was unfolding. Do you have a favorite story about production? But pregnancy turned out to be my secret weapon: people can’t refuse you; they invite you in, and open up. We had wanted to interview a mother who was estranged from her Ova daughter. She was very reluctant. It took us almost a year to set up an interview. Finally she cautiously agreed. When she answered the door and saw my pregnant belly, her mood changed. She smiled, welcomed us in, fed us, and invited us back for Christmas. How did you find out about getting Independent Television Service funding? Joanna: ITVS – an organization that provides production funding in the range of $100,000 to $350,00 for films to be licensed for PBS broadcast – is the Holy Grail for independent filmmakers. We had received some development money from their Diversity Development Fund (DDF) and had been working feverishly to apply for Open Call. Kate: For ITVS Open Call you need to submit a budget, a proposal and treatment, and a 10-minute work sample. The DDF award did not only give us money, but also staff guidance and feedback. It was the perfect testing ground. Because we were first time filmmakers they also supplied a mentor, veteran filmmaker Mylene Moreno. We also recruited help from our SocDoc mentors. I was working for Renee, and Joanna worked with Leo Chiang. They read all of our materials and watched our cuts. We did not work in a vacuum. Feedback was invaluable. Ovarian Psycos is an edgy film, we are newcomers, and the chances of landing an ITVS grant the first time were slim, so we pulled out all the stops. I think we re-edited our treatment fifty times in six months. When we found out we had a contract, Joanna and I were just ecstatic. What do you hope audiences will learn? Kate: It’s amazing to meet young women who demand – daily – that sexism, racism, and violence against women in all forms merits more attention. They work tirelessly using their bicycles, an ingenious organizing tool. I hope the film will raise awareness, not only about what young women of color face in East LA, but in communities across the country. Women’s issues are too often marginalized, and mainstream feminism often ignores factors like race, class, and immigration status. Joanna: While working on this film I often think about how much I wish I could have been exposed to a group like the Ovarian Psycos when I was younger. They put themselves on the line by demanding a space to be heard, claiming dark dangerous streets as their own, and providing a place for women to talk about issues that are important to them – it’s incredible. I hope audiences will be motivated, maybe to get on a bike, but also to do some thinking about the issues women and girls face in our communities. 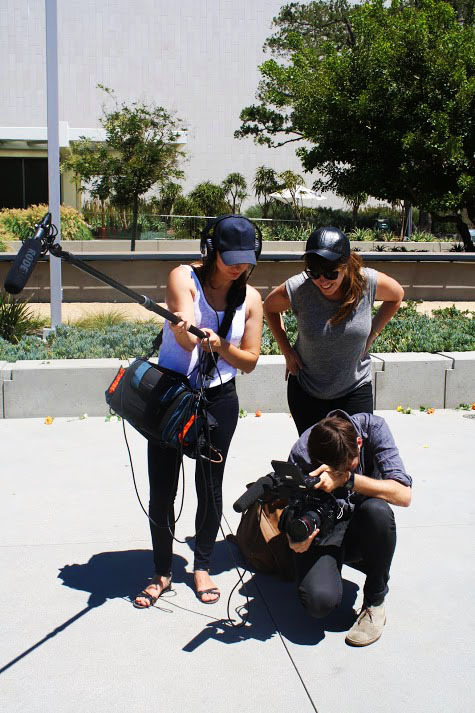 Filmmakers Joanna Sokolowski and Kate Trumbull-LaValle, based in San Francisco and Los Angeles, met while earning their M.A. in Social Documentation (2011, 2012) at the University of California, Santa Cruz. Directing their thesis films, the two instantly bonded over a shared commitment to produce intimate, nuanced portraits of the contemporary female experience. The filmmaking duo formed Sylvia Frances Films in 2013, named after their mothers’ first names, to jointly direct and produce their first feature documentary, Ovarian Psycos, in association with the Independent Television Service (ITVS).